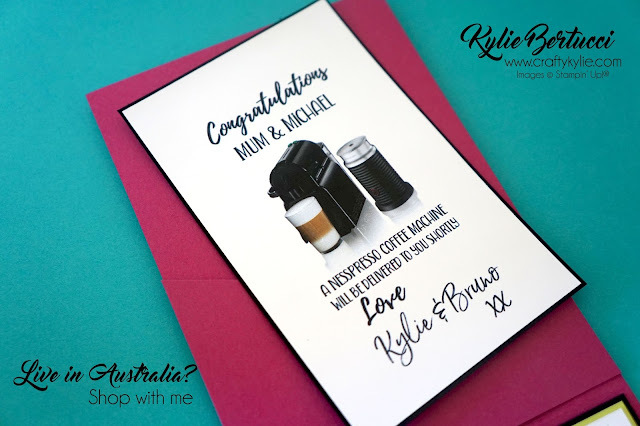 Kylie Bertucci Independent Demonstrator Australia: My Mum is here and NEWLY Married!! My Mum is here and NEWLY Married!! Exciting news - My Mum is visiting for a week!! Woo Hoo!! We were trying to work out how long it has been since we last saw each other.... You know it has been a while when you can't think of the last time... But it has at least been a year. I was very emotional when I saw Mum at the airport yesterday. Yes they are Bridesmaid T-Shirts and yes this is for real! hahahaha. Now you know where I get my amazing sense of humour from. Here is my fun wedding card that was inspired by those fun colourful bridesmaids shirts and basically sums up the fun my Mum has all the time. This is DEFINITELY not a traditional Wedding card - but Mum and Michael's wedding was far from traditional that is for sure! I love using my Designer Series Paper! If you find it hard to cut up that gorgeous paper then join my #loveitchopit Workshop Group by signing up here. You will then receive an email with a password. It will help you as it has helped many others to start chopping up that paper and using it to spread love to others. It's LIBERATING! No more paper hoarding, or one pack of paper from a fire hazard. 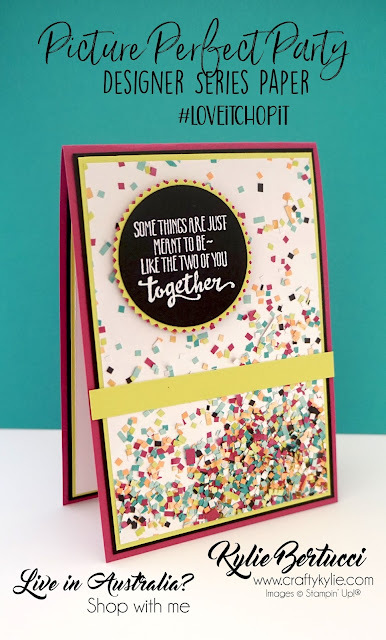 I love the colours in this card - Lemon Lime Twist, Berry Burst, Basic Black and the Bermuda Bay added in is STUNNING. 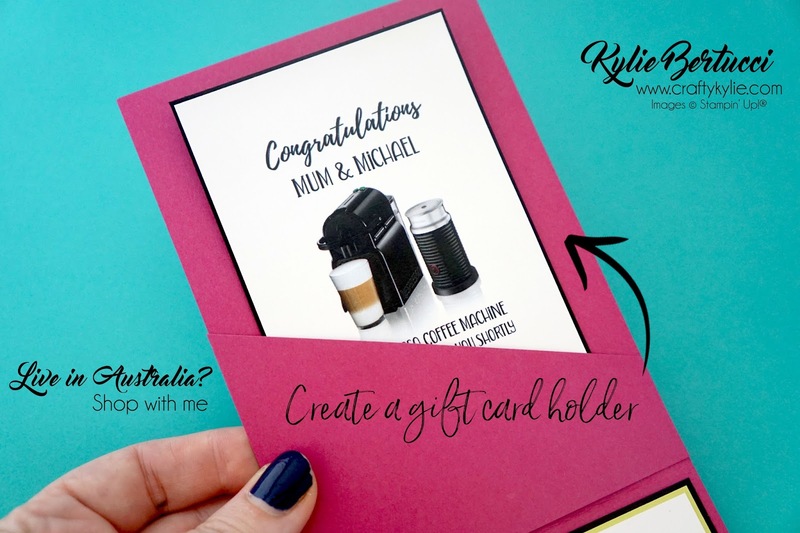 I made a little pocket at the top of the card to add in Mum and Michael's card. It is difficult to give Mum a gift while she is here when she is travelling to New Zealand - so we are going to get it delivered to her and Michael. I thought the little photo of what they were going to receive was a fun surprise and she LOVED it. I was so happy with the reaction. Mum with her husband to be and best man. Hubby is on the left. The interesting part in this story is that many years ago - 1974 in fact.. Mike and Mum were a couple! Things didn't work out back then so Mum moved on married and had five children, divorced and now 44 years later, Mike and Mum are now married. What a story right? Thanks so much for coming by today! If you like what you see and want to follow my blog by email for more ideas and updates you can click HERE. 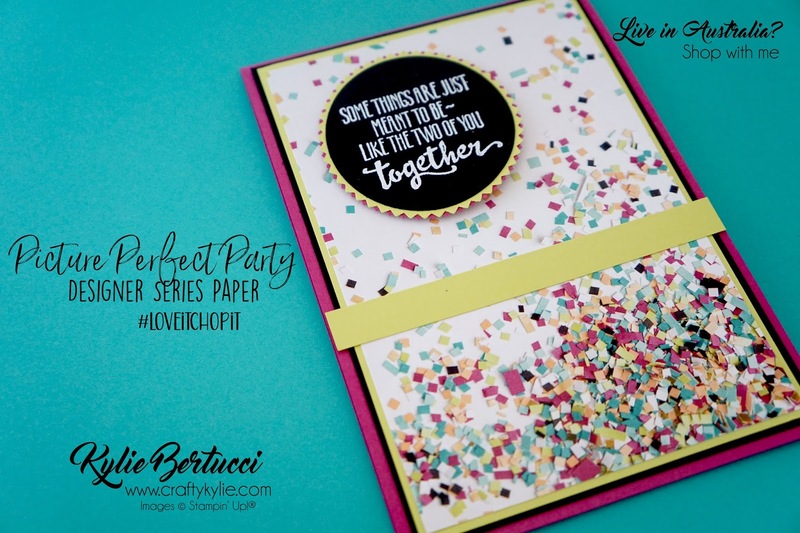 Remember to sign up for my #loveitchopit Workshop too! HERE. If you live in Australia and would like to go shopping you can do that 24/7 HERE. Oh how special!!! The romantic in me loves this... (((HUGS))) to you, your mum and Michael! What a beautiful story, so nice your Mum's come to visit too. Enjoy every moment.